Lights, camera, action! Get ready to share your photos with the world. With the new Photostory Deluxe, excitement is added to your best shots with camera movement, zooms and music in an incredible photo slideshow. Watch a wave of excitement come over your family and friends as you share your photo story! Our templates help you create an entertaining slideshow in no time at all. Included: New photo looks + 1,500 effects & music Bonus: Get the latest effects in the Photostory Store! Fun for your viewers, fun for you: Start creating a slideshow today. Work with the intuitive Effect Wizard for a simplified workflow. Show the route of your travels on an animated map and enhance the presentation with details such as stops along the way and your modes of travel. A journey through the Alps. A day at the beach. From a glossy print to a snapshot. Photostory works magic on all your photos and videos. Easily load photos to the program with the wizards or wirelessly, from your smartphone. Shaky photo? Poorly exposed image? With image editing in Photostory Deluxe, you can rescue and restore images so that they're slideshow ready. Create truly stunning images in record time. The program's automatic image editing completes the optimizations so you don't have to. New: Transform your recordings with popular photo looks in a single click! Sometimes, simple photo corrections and enhancements just aren't enough - you need expert tools in order to achieve the best look for a photo. Photostory Deluxe offers a new curves tool for precisely modifying color values and brightness. A single event. Multiple beautiful images. The innovative shot match feature lets you select your favorite image and transfer its style to other images. Get ready for the big reveal! The new effects wizards help you easily bring your photos together to create an exciting story with stunning effects and the ideal background soundtrack. First and last impressions are everything. Start and end your slideshow on a high note. Use the included high-quality animated intro and outro templates to lead your viewers to your most exciting shots. Keep the excitement going - even when you're just switching from one image to the next. Exciting transitions add further creative touches to your slideshows. Every picture counts. Each and every image tells a tale. Breathtaking camera tracking shots and zooms let you dive right into an image to show specific details and tell the story behind them. With 1,500 effects, music & sounds, Photostory Deluxe offers everything you need to create a slideshow that's truly unique. Just browse through the effects collection – you'll see how impressive it is. Mountains, birdsong or church bells from a distant valley. The dramatic music starts to play as the images of mountain face looms above. The images then switch to the view from the peak with relaxed instrumental music. Amazing music and sound effects are all included in Photostory! Bam! Boom! Splash! Add fun and exciting details to images with decorative elements. It’s the perfect way to enhance any image! Picture-in-picture, not picture follows picture. For more variety and more dynamics, it's the perfect way to present similar photos in a single picture collage. Access the effects of tomorrow for use in your slideshows today. Entertain your audience with never seen before intros/outros, transitions and title animations. 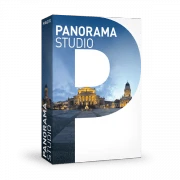 In the Photostory Store you have access to newly designed effects. Choose your favorite effects for free with an effects coupon with a value of up to $49.95. Brand new and exclusive to Photostory Deluxe: Apply effects directly to images with a single click. In full screen. With preview. It's the fun way to edit photos. You can set the integrated Photostory Wizard to design your slideshow for you from start to finish. Just choose the photos and the wizard does the rest! Every single one of your photos can be used in your slideshows. There's even a creative solution for portrait photos with black borders. And there you have it - a finished slideshow ready for sharing with family and friends. On DVD, Blu-ray, or USB stick. The Export Wizard is ideal for sharing your slideshow with others quickly. Videos are particularly popular in slideshows - as long as the footage is smooth. High-quality image stabilization solution proDAD Mercalli V2 is included to fix shaky material. Cutting edge today. Cutting edge tomorrow. To keep you up-to-date while you're creating your slideshows, you'll receive all future new features and effects for free for 1 full year! With the update service you will receive 1 full year of new features and updates for free, which can be used indefinitely. If you reinstall the program after one year, you will have access to the basic version. After the one-year update service has expired you can extend it for a discounted price. The free tutorial videos from MAGIX provide you with an initial look at various MAGIX programs. You'll learn quickly and easily how to use the most important features in order to bring your own projects to life. 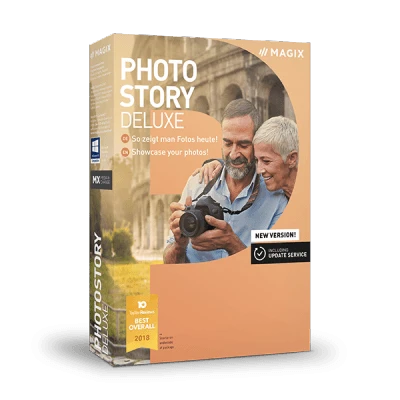 "Photostory Deluxe is one of the top slideshow creation programs as it provides HD quality and has one of the most extensive photo and music editing toolsets we saw." "This is a handy piece of software with everything you could possibly need for creating professional slideshows." "You can make something simple yet professional looking in a matter of minutes or you could spend much longer and create something amazing!"